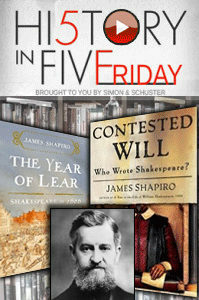 July 22, 2016 – It’s History in Five Friday, presented by Simon & Schuster — kicking off your modern weekend, with people from the past. Today, we meet lifelong Shakespeare fan, industrialist Henry Clay Folger, who founded the Folger Shakespeare Library in Washington D.C. to serve as the leading western research and education center on the famous playwright. We have a familiar passenger in our time machine: James Shapiro, Professor of English and Comparative Literature at Columbia University. He’s the author of Contested Will: Who Wrote Shakespeare , and The Year of Lear: Shakespeare in 1606 . You can hear our interview (recorded in the shadow of Shakespeare’s Central Park statue), wherever you enjoy our show.